Discover the magic of words with the Touch & Teach Word Book by VTech. Cody The Smart Cub and Cora The Smart Cub teach letters and more than 100 words in four different activities. Twelve interactive pages come to life with the touch of a finger. Make reading an even more interactive experience with the Touch & Teach Word Book. 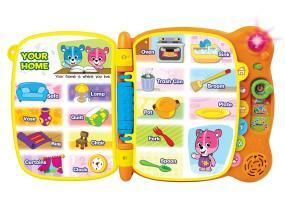 Each page reacts to your child’s touch with sounds, words and music. 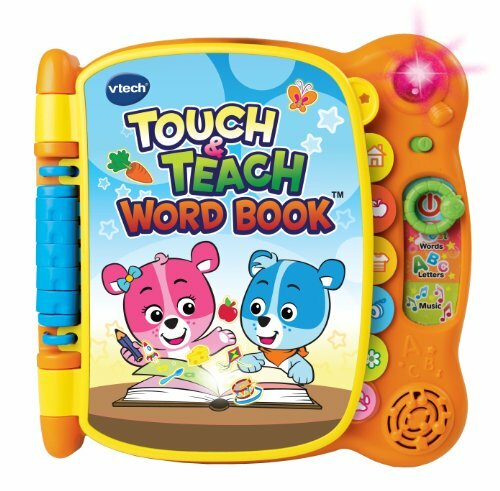 This word book includes more than 100 words, 90 unique sounds and 15 melodies on 12 fully-colored and incredibly detailed touch sensitive pages. Play in four different modes including What’s That Word?, Letter Fun, Music Time and Find It Quiz Game. The Touch & Teach Word Book also helps expand your child’s vocabulary by introducing the ABCs and helping them read while associating words with pictures and sounds. Available in orange and pink. Make reading an even more interactive experience with pages that react to your child’s touch with sounds, words and music. Includes more than 100 words, 12 fully-colored and incredibly detailed touch-sensitive pages and more than 90 unique sounds and 15 melodies. Four different modes of play include What’s That Word?, Letter Fun, Music Time and Find It! Quiz Game. Helps expand your child’s vocabulary by introducing the ABCs and helping them read while associating words with pictures and sounds.